This guide is a manual process to recreate the stock SD image RetroPie released on the RetroPie Website for the Raspberry Pi. If you aren't comfortable with the terminal you would be wise to just use the RetroPie SD image provided. The RetroPie SD image is built on top of Raspbian lite (Raspbian without the PIXEL desktop environment) RetroPie can also be installed on top of the full Raspbian but you can't run Retropie and PIXEL at the same time, you will need to logout of the PIXEL desktop environment in order to run emulationstation and the emulators RetroPie installs. You can download a fresh Raspbian Image from here. The Raspbian image can be installed the same way as the RetroPie image as described here). Raspbian now automatically expands the filesystem so that step is no longer necessary. Most of the install scripts will attempt to install a variety of packages and libraries that each emulator requires. These installations will fail if your system locale settings are invalid. You can easily verify this by executing locale command. A valid locale will return values set for all options, such as in the example below. If any of the above configuration lines are unset (particularly LANG, LANGUAGE, and LC_ALL), you should set them before installing RetroPie. The easiest way to set each item is to use the update-locale command, such as $ sudo update-locale LC_ALL="en_US.UTF-8". Users can also set the local through the raspi-config tool. A reboot is required before these changes will be reflected by the locale command. Running Emulationstation requires a larger than default GPU memory split. Make sure you reserve enough memory for Emulationstation by modifying the /boot/config.txt configuration file or by using raspi-config as described in the Memory Split page. A reboot is required after any modifications to the video memory allocation. This will install the core and main packages which are equivalent to what is provided with the RetroPie SD image. Say you don't want to bloat your system with all of RetroPie - you also have the option to only install the emulators you want. When you select Manage Packages, you will first want to start by installing the core packages. The core components needed for RetroPie to function are: - RetroArch: Frontend for the libretro api, necessary for most emulators to run. - EmulationStation: Frontend for sorting and launching all of your games. 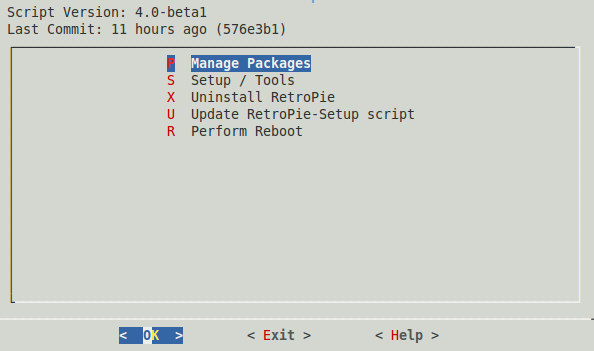 - RetroPie Menu: Menu in emulationstation for simpler configuration of your system. - Runcommand: The runcommand launch menu that assists launching your games with proper configurations see related wiki page HERE. Emulators can be installed and updated individually from the Main, Optional, and Experimental packages. If you want to use samba shares you can set them up from the setup/tools option of the retropie setup script. If you're booting to the desktop you'll want to disable the retropie splashscreen from the setup script first. On Debian Jessie add consoleblank=0 to the existing line in /boot/cmdline.txt (with a space before it so it's an additional parameter). This prevents the screenblanker kicking in. With it, runcommand dialog is always displayed. There is also a gui option in RetroPie-Setup -> Configuration / Tools -> Raspbian Tools to disable the blanker, but it doesn't work in Jessie due to a Debian bug.